With energy costs going up every day, we’re here to help you find ways to lower your monthly utility bill. Everyone is concerned with high energy bills. This is especially true in McKinney, TX where temperatures can be extremely low in winter and then soar in the summer. Bill Joplin’s Air Conditioning & Heating would like to help our customers with their high utility bills. One of the best things you can do to keep monthly electric bills lower is to make sure your heating and air conditioning system is running at its most effective and energy efficient level. We created our Preventive Maintenance Agreement with the idea of saving you money on your utility bills, plus to provide you with additional peace of mind that system inspections were completed to head off unanticipated repairs. With our exclusive Preventive Maintenance Agreement, our highly-trained and certified technicians thoroughly inspect and maintain your system annually. You’ll get two comprehensive tune-ups per year (Spring and Fall). Lower utility bills because seasonal tune-ups of your system improve efficiency and comfort. It will literally pay for itself every month! Competitively Priced, Plus a Discount! Our Preventative Maintenance Agreement is competitively priced to help our customers in Collin County who are struggling with high utility bills for only $100 per system each year! When your home system is operating at peak efficiency, you’ll save money every time you turn it on. In many cases, the energy savings are more than enough to pay for the low monthly cost of the maintenance agreement. Priority service in scheduled emergency repairs. BONUS: Ability to transfer the contract to a new owner or your new home in Collin County. 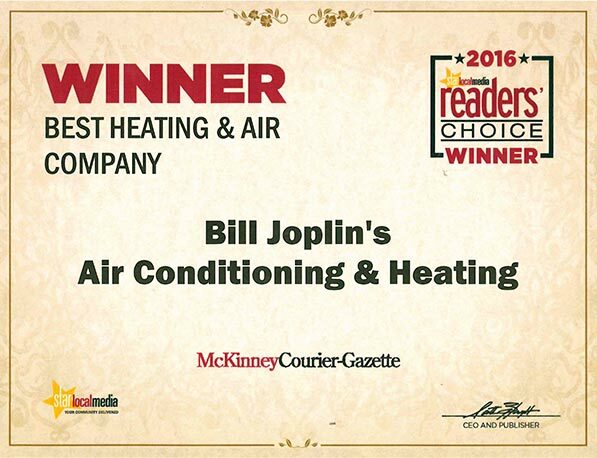 Call us today to schedule preventive maintenance on your heating and cooling system. To schedule an appointment for Preventive Maintenance, fill in the information below. Someone from Joplin’s will contact you shortly.